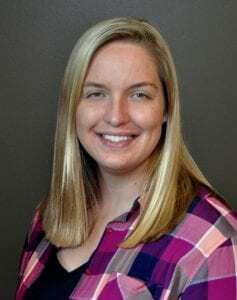 Johnson County K-State Research and Extension has hired Belleville, Kan., native Jessica Barnett as their new agriculture and natural resources extension agent. Jessica replaces long-time agent Rick Miller who retired July 24. Barnett will be responsible for the development and delivery of educational programming relative to agriculture-related information including small acreage management, pasture and forage management, pond management and water quality, home pest control, crop and livestock production, environmental stewardship, farm and ranch management and agriculture public policy. She earned bachelor’s degrees in Agronomy and Biological Systems Engineering, both from Kansas State University. After graduation, Barnett most recently worked as an agronomist and agricultural engineer for Agro Engineering in Alamosa, Colo.
Local extension faculty are jointly employed in a partnership between K-State Research and Extension, headquartered on the Kansas State University campus in Manhattan, and the local extension board.